I began by asking Eilis questions about synaesthesia, moving onto her other activities afterwards. Leslie: Can you describe, please, what synaesthesia is, and how it affects you in everyday life? Eilis: I’m not sure I know how to describe synaesthesia in a way that is medically accurate, but I think it’s a neurological condition that causes a lot of traffic between sensory regions of the brain which might otherwise be separate, so it’s about making sensory connections where others might not experience them. To use an example, I can ‘see’ smells. Smelling perfume is a very colourful, visual experience for me. By ‘see’ I mean that I have visual hallucinations, they occur like blurry clouds or shapes in my field of vision, but in a way that seems somehow removed from the tangible objects in my field of vision. I can usually tell the different between the hallucinations and ‘real’ stuff, but sometimes it takes me a minute to adjust. A particularly loud sound can sometimes make me throw my hands up to protect my face, because it might seem as if an object is flying towards me, when in fact, it’s just an hallucination caused by the sound. Leslie: How do sensory entanglements generally affect people with synaesthesia – and how do they affect you? Eilis: Synaesthesia appears to be something of a spectrum. Some people will only experience one type of sensory merging (e.g they might see individual letters or numbers as always appearing as a particular colour in their mind’s eye), whereas some people, like me, might experience a variety of different types of blended senses. I don’t know many people with synaesthesia, but those I have spoken to have said they wouldn’t want to be without it. Because my synaesthesia is so pronounced I think it would take me a long time to adjust to life without it. The last few years, I’ve been writing little blog posts about how it has affected my life, and it’s made me realise how much I rely on it. It helps me to choose which chords to use in a song, to tell what mood people are in; I use it tell whether the water in my bath is too hot or too cold, I even use it to choose the words I write, or say. Watching the changing colours in my field of vision tells me so much about the world around me, and without them, I don’t know how I’d navigate my life. Leslie: You live a very varied imaginative life. So on Twitter you list a number of interests: Monsters/Folklore. Bassist. New screenwriter. Dark songs & stories. Podcast whisperer. Steampunk… Can you tell us about these creative activities, please? Eilis: The monsters & folklore reference relates to my PhD research. I’m currently a PhD student and a part-time tutor at the University of Portsmouth. I research monster theory, which basically asks the question: why do different cultures across time create stories about monsters? How do these monstrous beings help us to better understand the societies which spawn them? My interest in Steampunk (a subculture which might be characterised by the veneration of and re-connection with past technologies) was fuelled by an initial academic interest. I presented a paper exploring certain diabolical connotations attached to technology in the Victorian age, at the Asylum Conference in Lincoln last year. So really you could say I went for the monsters but I stayed for the Steampunk! The atmosphere at the festival was fantastic: exciting, inclusive, and just a wonderful event to be a part of. I’m hoping to return this year. Screenwriting was something I got into via a local festival, Darkfest, organised by my PhD supervisor, Dr Karl Bell. 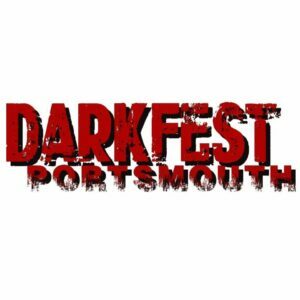 Darkfest is a festival which runs in the autumn in Portsmouth, and is packed full of macabre themed events. 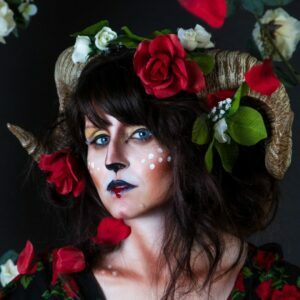 I was brought in as a folklore consultant for the opening night immersive theatre show, and ended up writing the narrative elements for show, and also writing a short film presented on the night, directed by Dr Lighthouse (Roy Hanney). I’m now working on another screenplay, and am really enjoying learning about, and developing the craft. I’d love to take it further once I’ve completed my studies. We’ll see! I’ve been extremely lucky to work with Karl, and he’s introduced me to so many other very talented creatives in Portsmouth, such as authors William G Sutton and Matt Wingett – invaluable members of the local artistic community, as well as the crew of the Portsmouth Writers Hub, and the Front Room music and spoken word events. As a result, I feel I’ve really developed as writer, whether that be research papers, talks, writing for graphic novels, films or developing concepts for immersive theatre. 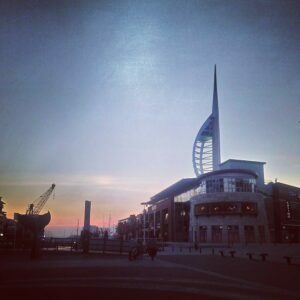 Portsmouth, and Southsea in particular, is such a rare gem in terms of its strong creative and cultural identity. We’re very lucky to have many very supportive local businesses too, spots like Hunter Gatherer café, and Blackwell’s on-campus bookshop, helmed by the wonderful Jo West, Sadly, the shop is sadly no longer trading. Before I attended university back in 2012, I’d been writing off and on for years – just dabbling really, but mostly dark, supernatural, magical stories. As a result of starting into monster studies research, I found those themes began to seep into my songwriting too. Previously I’d worked as a professional bass player for many years in London, and Northern Ireland. I’ve been incredibly lucky to play with some wonderful musicians. My main band are Jackie Rainey and the Sweet Beats, who I still gig with, and it’s an absolute pleasure to be a part of that – they are just so talented, and immense fun. As for podcasts, well I’m just addicted to them, they really help me unwind after a day of writing, or teaching. I’m a big fan of the brilliant Supercontext podcast, who frame their shows as ‘a digital autopsy of media’ – a must-listen for pop culture addicts who like to do their research. I also love Schoolin’ Life podcast – a show which feels like having a really good night in with friends – it really warms my heart when I need cheering up. Leslie: If you’ve researched people with synaesthesia who were they, and what did your research add to your understanding of being a synaesthete? Eilis: I haven’t really researched anyone specially, other than a cursory Google here or there. It seems that a lot of artists and musicians have it. I think being a synaesthete naturally drives you to explore aesthetics because, as a synaesthete, we see so many beautiful things in the world which other people can’t. I stick on one of my favourite songs and all of a sudden I’m surrounded by a sunset which tastes like candy floss – but I might be in a queue in the supermarket. What a wonderful thing to have! Not all synaesthetic experiences are positive though. Some words taste absolutely disgusting, for instance. Nest week, in part two of my interview with Eilis Phillips, I ask her about her academic work, her experiences of synaesthesia and how ‘being different’ has affected her world view .